First time in 2015 we’ve gone on a ride without layering the clothing. 58° and sunny made for a good day! Tomorrow is forcasted to be warmer!!!! 60° plus!!! We went and checked out the wetness factor of the old Whitney Tailings pond, our normal riding area. With about 4-5″ of slop, which includes thick red mud and plenty of frozen ground underneath. We turned around, and pedaled around town a bit. The way the warmth is coming on, and a couple good rains I figure the red dirt will be ready in 3 weeks, maybe less. 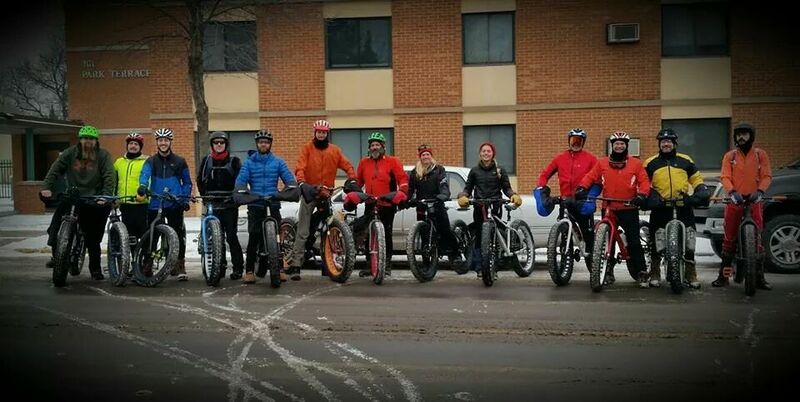 I’m going to depart from the normal FatBike info here, for a post….. it’s an issue that gets me very fired up! So fired up I penned a letter to the editor last week!!! And the Duluth News Tribune piece I wrote….. So you have been warned, this post will contain huge amounts of my opinion….. if you can’t deal with it…. click back now. 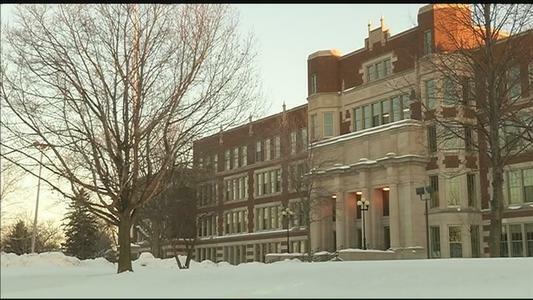 For the record, I’m a 1986 graduate of Hibbing High school….. and am currently ashamed to state that fact! Due to an ongoing and very VERY troubling situation concerning a high level employee of ISD #701….. with allegations of harassment and sexual misconduct. Kids being hurt by the very leader/s that are suppose to protect them, and provide a safe and welcoming learning environment…. burns me to my core….. and I just can’t keep quiet! Here’s is an email I sent to all school board member’s and multiple news outlets, both local and national!! Pure unadulterated unprofessional behavior by adults!!!! We are a family that is concerned about our children moving forward in the Hibbing school district under your current leadership. It has become painfully obvious the school board needs to be wiped clean, and fresh new faces be put in place, regardless of where each member’s term sits!! There’s no two ways about it, the leader of ISD #701 has failed at his job, miserably; along with each and every subsequent board member. For the simple fact of your failure to act quickly and without hesitation, and the severely unprofessional way you all mishandled the Fleming situation…… you all should be ashamed of yourselves, and be stripped of your duties AT ONCE! Maybe if any of you had a spine and or the common sense to do what is/was right, you’d all step down at the same time! Sure it would leave void, but then none of you could do any further harm to Hibbing, and the Hibbing school district, and the hundreds of kids supposedly under your care. 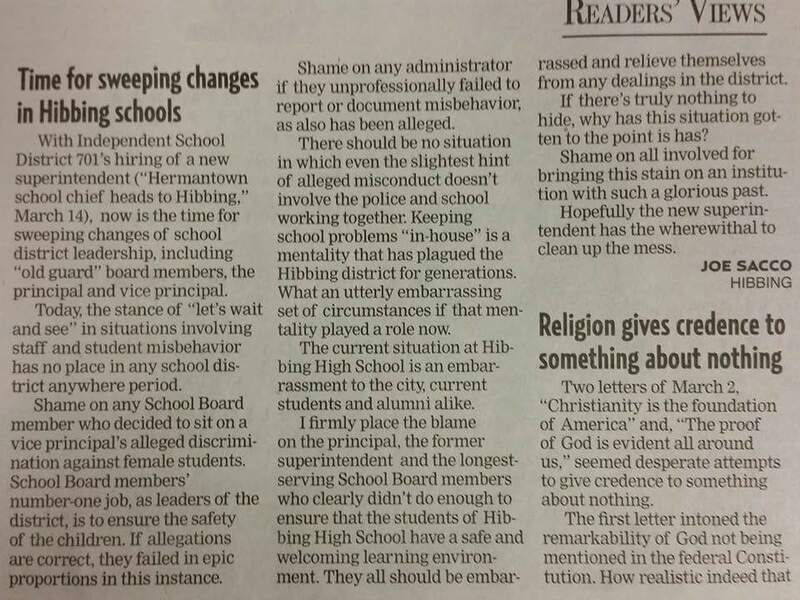 Hands down, this is a stain on the whole of the Hibbing school district, and the city of Hibbing itself. A stain mind you, that will take generation’s to clean away, if at all!!! Further more, each and every one of you will be on permanent record as the leaders who failed the children under your care. The current and unprofessional people (you as board member’s), that are in charge of ours, and every child that walks through the doors of HHS, and every other school under your supervision…… which are to be supplied with a SAFE and welcoming learning environment. Sadly, this is and has not been at the fore front of your minds for quite some time! Saving your own skins, along with playing the “good old boys” card; and trying to play the system has been priority number one; when it should’ve been the exact opposite! For crying out loud, how many reports of misconduct (by Mr. Fleming) did you need to see, before you thought to yourselves……. we better do something, before Flemings actions come back to bite us?? Well, guess what…… it’s past that time now, and you are all to blame!! 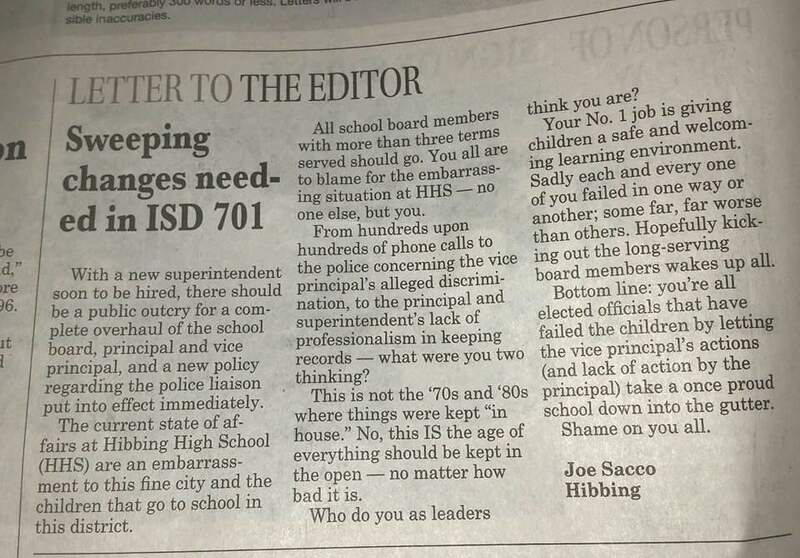 If Mr. Fleming is reinstated into his former position we DO NOT feel confident in ISD 701, and you as leaders to provide that safe and welcoming learning environment. You’ve all proven your incompetence in the Fleming case. Above everything I’ve said previously, your own employees (the educators of ISD 701) have placed their vote of NO CONFIDENCE in Mr. Fleming…… Almost unanimously!!!! The voicing of their opinion should speak volumes against placing Mr. Fleming back in his old job; above and beyond anything else!!! Are you listening to your educational staff???? Please do not say your hands are tied!! They are not and each and every one of you know it!! Stand up for what’s right and just for once in your last actions as ISD 701 school board member’s…… and DO NOT let another child be wrecked for life by a monster posing as a leader and mentor of children!! Please get the wolf in sheep’s clothing out of an opportunity to hurt children, and then follow him out knowing you’re doing the right thing!